Augsburg senior Jen Janda has been "Diggin Dinos" this summer. No, she is not on an archeological dig in Egypt, but in downtown St. Paul. "Diggin' Dinos" is a summer celebration honoring the 100th anniversary of the Science Museum of Minnesota. Beginning Memorial Day weekend, 80 dinosaurs were placed around the streets of St. Paul and 20 in the parks of Minneapolis, as part of this celebration. Much like the Snoopy statues a few years ago, local artists are painting these dinosaurs. Of the more than 250 designs submitted, Janda's was selected. Its home for three months will be Murphy Square park, which is located in the heart of the Augsburg campus and is Minneapolis's oldest park. The theme of Janda's dinosaur is "Auggiesaurus." "My idea for the Auggiesaurus was to incorporate Murphy Square's history (it started as a place to graze cows) into a 'map' of the various activities that go on in the park each spring and fall due to its location in Augsburg College's campus," Janda said. On Wednesday, May 23, Janda started painting her dinosaur during the "Paint-off" held at the RiverCentre in St. Paul. 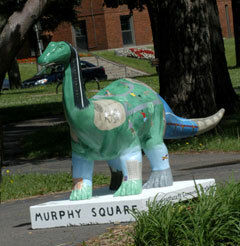 The Auggiesaurus made its way to Murphy Park Memorial Day weekend and is making its home there until Labor Day, when some of the statues will be auctioned off.